Running makes you fit and healthy. When you run you lose weight. When you run you increase bone density. When you run you strengthen your immune system. And the list goes on. But no matter how great running is for you, it still puts stress on the body. This stress can be beneficial if managed correctly, but it can be harmful if not. Every stride you take places impact on your body. Without the proper shoes, a misalignment can occur thus causing injury-related pain. That’s why it’s essential to protect your body when you run. Otherwise, you could develop knee pain. And no one likes a sore set of legs halfway through a run. One of the best ways to handle knee pain is with a shoe that fits well and is comfortable. We have picked the ten best running shoes for bad knees to help. Although some people think running is bad for your knees, this couldn’t be any further from the truth. Running is the most natural form of exercise you can do. You are born to breathe, you are born to move, and you are born to run. So whether your knees hurt from training errors, an old injury, or arthritis, the right shoes will help. Wearing a pair of running shoes that fit properly and are comfortable will make a big difference. Many people will use the excuse of bad knees to avoid running. Don’t let that be you. Instead of nursing the effect, fix the cause. Find a running shoe that relieves pain, not causes it! I’ve run many miles and have learned many lessons when it comes to knee pain. Here’s what I can tell you if you have knee pain — find a shoe for your foot strike and one that’s supportive and comfortable. That’s because running with the wrong shoe can wreak havoc on your knees. Yes, running with the wrong running shoe can easily cause knee pain. It has in my own running. If you wear a running shoe that does not support your foot shape and strike then your running shoe could be causing the pain. I can’t tell you how many new runners have told me they experience knee pain and we fixed it by changing their shoe type. For example, let’s say you have flat feet which cause you to overpronate. If you wear a neutral shoe, it does not support an inward roll of the shoe. If you wear a neutral shoe with flat feet, I can almost guarantee your knees will eventually hurt. The shape of your foot and the sizes of your arches will dictate the kind of shoe that you need. Then add in features for shock absorption, and you have just found the best running shoe for bad knees. With a pain-free set of knees, you can run farther and faster without holding back. You will be able to run more often and maybe, just maybe, you can get rid of those post-run ice packs for good! First, you want to find a shoe best for your foot strike. Whether you overpronate, supinate, or have a neutral stride, there is a shoe for you. Here’s a tip: Runners with flat feet likely overpronate and runners with high arches likely underpronate (supinate). In between the two is a neutral foot strike. So first find a shoe best for your stride, step, and stance, then move onto some of the other critical factors. After finding a shoe to match your foot strike, if you have bad knees choose a well-cushioned shoe. A shoe that ranks high in comfort will help absorb the shock to your knees when hitting the ground. Cushion for shock absorption is especially needed when running on the road. I’ve run marathon distances on a trail where my legs felt fine, and I’ve run the same distance on the road where my legs were sore as can be. Comfort is king when it comes to bad knees and running. It’s also important to understand that overpronation is one of the leading causes of knee pain. The pain you feel is typically either in or around the kneecap and the outer part of the knee. In the running world, we call this pain “runner’s knee” and “IT band syndrome“. To help with overpronation, find a running shoe design with extra support. Extra support will provide a more natural foot strike from heel to toe. With a natural stride, your body becomes in alignment thus prevent the excessive stress of the knees. 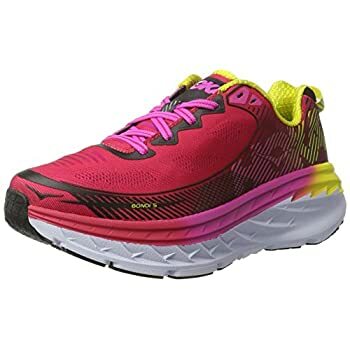 So with a shoe made for your foot strike, comfort, and support, you will reduce the pain in your knees and be able to run much more frequently with far less pain. So read on as we list the top ten men & women shoes for bad knees. 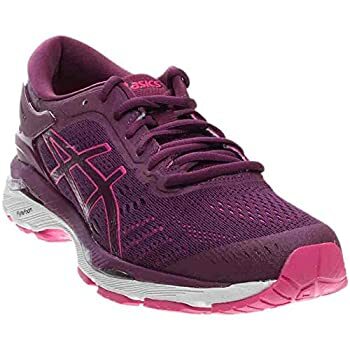 The Asics Gel Kayano 24 is not just one of the best running shoes for bad knees; it’s one of the best-selling running shoes in the world. And since knee pain is the most common injury when running, it makes it an ideal choice. Its guidance system helps overpronators keep their foot roll efficient and stable. Given the name, the best feature of the shoe is its rear foot and forefoot GEL Technology Cushion System. The gel technology absorbs shock from the toe off entirely through the gait cycle. Extra shock absorption around the heel with also prevents heel striking. The more shock absorption, the easier on the knees and that’s what makes this shoe so popular. Its user praises it for excellent comfort and snug fit. If a shoe can alleviate the pain when you run it’s more than a shoe, it’s a solution. And that’s why it one of the best-selling running shoes in the world. 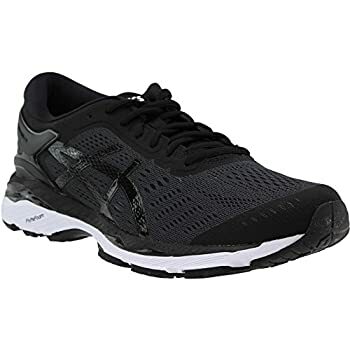 Pros- snug fit, excellent stability for flat feet, gel in the heel for extra comfort, upper mesh keeps stability shoe flexible, great for long distance. Cons- expensive, heavy stability shoe. Here is where durability and great price meets. 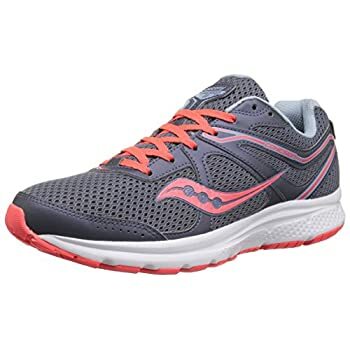 The Saucony Cohesion 11 is a neutral shoe built for both stability and comfort. Whether you’re thinking about running for the first time or considering running a 5k, this shoe can help you. It’s a great beginner shoe that’s made to last. If your new to running and don’t want to invest too much money but still want good quality, this will be your best choice. The best feature of the shoe is the durable rubber outsole. If you have a neutral foot strike and need relief on the knees, you have a good chance with this model. The heel grid system promotes and stable cushioned ride. Users love its reliability. It’s a shoe you can count on. Pros- flexible upper mesh, firm outer sole for stability, great price. Cons- toe box tight, larger fit by half a size. Here’s one for the underpronators. 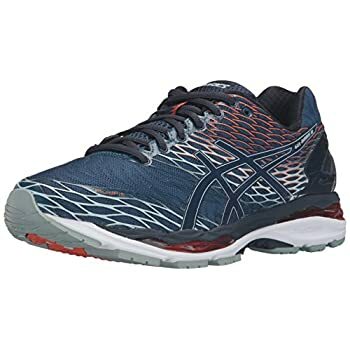 If you’re looking for a shoe for high arches, at a reasonable price, and that’s also stylish, then check out the Asics Gel Venture 6. Its design helps with supination. It achieves this by incorporating a rear foot Gel Technology Cushioning System. When you have high arches, because there is less ground contact, the shock is greater in a smaller area. Similar to someone stepping on your foot with their whole foot vs. with only their heel. The gel system helps absorb some of the extra shock. It even comes with a removable sock liner! Sometimes it’s hard to determine where your knee pain is coming from. But if you know the pain is from high arches, you might want to give this shoe a try. That’s because if you wear medical orthotics simply remove the sock liner to insert them in. Through the reversed lugs this shoe works for all different terrains. Its users love it for its accurate sizing and comfort. They even have a removable sock liner for medical orthotics. Users have praised it for working well on both the road and trail. Pros- excellent comfort through the gel cushioning system, great traction, price, fits accurately. Cons- need time to break it, narrow design. Need some extra cushion on race day? 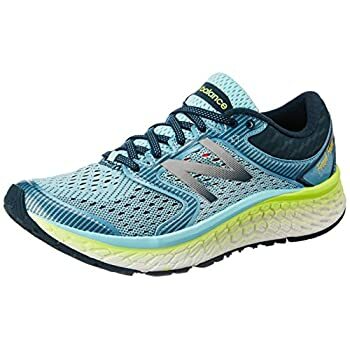 If you run with a neutral stride, then the New Balance 1080V7 has you covered. It’s most helpful feature is what New Balance likes to call “fresh foam”. Simply put, it’s a technology built into the sole for extra comfort. As a runner, you can never have enough cushion, especially when dealing with knee pain. But remember– this is a neutral shoe. So if you overpronate, this shoe will not relieve pain no matter how much foam they pump into it. 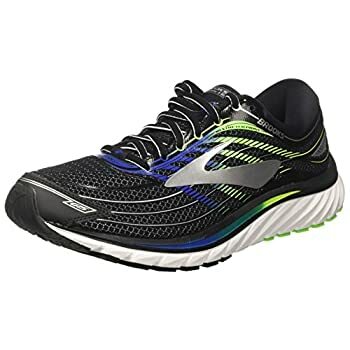 If you are looking for some extra cushion while hitting the treadmill or tackling a half-marathon, consider this shoe. Its users have praised it saying it’s like running on a mattress and love its roomy toe box. 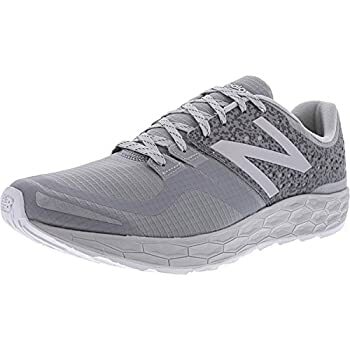 An excellent choice if you are looking for a comfortable neutral run around the block or lacing up for your next race. Pros- heel absorbs excessive shock, durable rubber on the outsole makes them wear slower, excellent cushion, open toe box for wiggle room. Cons- pricey, only for a neutral foot strike. 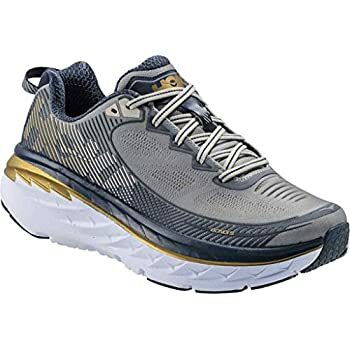 Hoka One One provides a “Time To Fly 30-Day Guarantee”. They believe so much in the smoothness and comfort of their shoe; you can return them if you don’t love the experience. Now if that’s not reassurance, I don’t know what is. Makes me want to pick up a pair to try them out for myself. The Bondi was Hoka Ones One’s first road running shoe. The company originated in the trail running world, and a lot of ultramarathon runners swear by them. Five versions later the Hoka One One Bondi 5 offers a full-length EVA midsole which provides a nice and smooth ride. It also fits better than its proceeding version and is more comfortable too. The shoe provides a smooth ride, excellent comfort, all with a light-weight feel. I’d even consider taking them for a spin out on a light trail. After many miles on your feet, a stable and comfortable shoe can feel heavy. And at first glance, this shoe appears bulky. But through their 3D puff print frame, they can maintain a lightweight feel for even the longest of runs. Its users love their unique feel. 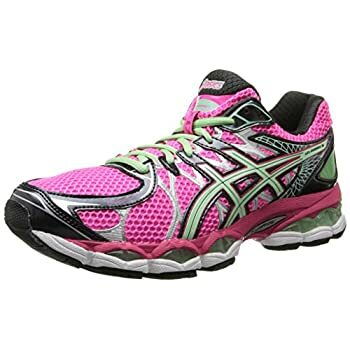 Larger runners who need extra stability and comfort are recommending them too. They also offer some pretty cool color options. Pros- smooth ride, stability, lightweight, wide toe box, excellent cushion, multiple color options. Cons- some felt the tongue was uncomfortable. 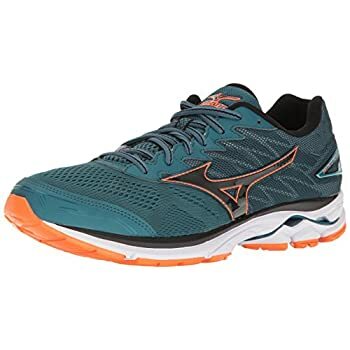 If you’re looking for an innovative neutral shoe that’s comfortable but not too heavy, consider the Mizuno Waver Rider 20. Mizuno provides an innovative wave technology to their shoes. It’s inspired by nature and mimics the way waves work. Within the shoe is a wave plate that disperses energy from impact when your feet strike the ground. The plate allows the shock a broader area which provides a superior smooth and stable ride. This will certainly help with any knee pain. 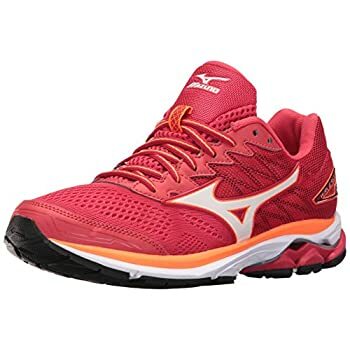 It appears that runners who had a positive experience with Mizunos’ wave technology never switch back. It may not be the best option for long distance, but people are using them for exercise as well as everyday use. They will definitely add a pep to your step during a 5 or 10k. Because Mizuno is not one of the best-known companies, you might be hesitant to try them. 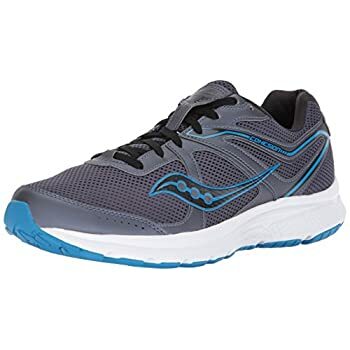 But I think if you’re struggling to find a neutral shoe that’s smooth and comfortable, the Wave technology could be worth a try. Its users love the shoes smooth ride, and some runners thought the wide version was the best option. An innovative shoe for a new and improved running experience. Pros- lightweight, very breathable, responsive, excellent heel cushion. Cons- not the best option for long mileage, high price. If you ask me, the best part of the Brooks experience is their specialization in high mileage. They really understand what it takes to be a marathon runner. Oh…and they have an enormous community of marathon runners to prove it. 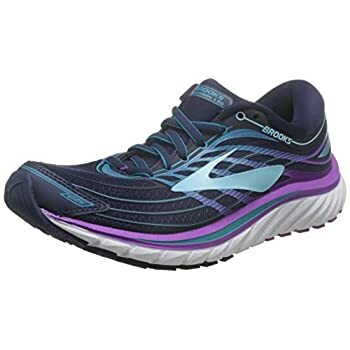 The Brooks Glycerin 15 is one of Brooks most cushioned shoes and is built to withstand high mileage. Long runs can be stressful to the body. We all understand this on some level. Well, this shoe helps with that stress, and since it’s designed for long distance, it does it well. With its molded midfoot saddle it provides a lightweight and supportive fit. In addition, they also offer a plush transition zone to help the transition from heel to toe to be much more soft and natural. This is what creates the smooth ride for long mileage with neutral to high arch feet. It users say they provide excellent comfort through their long weekly mileage. Pros- durable outsole for long mileage, quality material, breathability, comfortable ride. Wow…if you are looking for color options then you will find them with the Nike Dart 12. Nike may design the most stylish shoes on the market today. And the Nike Dart 12 has a large variety of color options to prove it. Don’t worry about matching a running shoe with your running outfit again with this shoe. 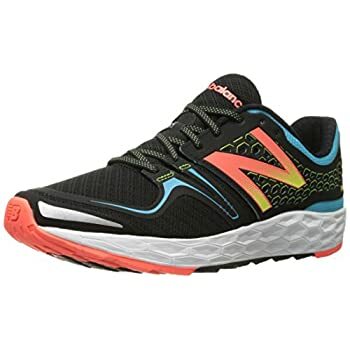 If you have a neutral stride and need a daily running shoe with cushion and solid arch support, then consider this shoe. With its molded midfoot saddle it provides a lightweight and supportive fit for neutral to underpronating strides. Remember–anytime you buy a new running shoe you need to ease into your mileage. So start low, build up your mileage and enjoy the snug fit of this shoe along the way. Its users have praised it for the style and comfort. 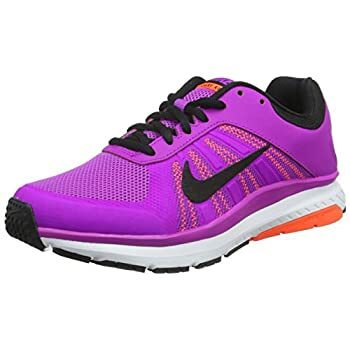 Nike is a reliable name that provides a reliable and stylish running shoe. Pros- snug fit, durable outsole for long mileage, affordable for a NIKE shoe, excellent ventilation. Cons– some runners experienced sizing issues. When a shoe model makes it to number 20, you know it delivers on its promises. When it comes down to it we don’t buy shoes just to buy them; we buy them to accomplish a particular result. Whether that’s running fast, long, stylish, or pain-free, results are what we are after. 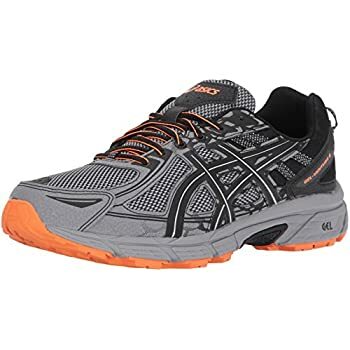 With that being said, the Asics 20 Gel Nimbus is a marathon shoe. If you’re looking for a neutral shoe with a lot of features to run your next marathon, here it is. A lot of technology sits right in the heel area. They offer an external heel clutching system for improved support and heel fitting. As well as rearfoot and forefoot gel for a softer impact. If you are like most runners and heel strike, this will help prevent pain caused by overstriding. It comes in many different color options and is a fan favorite on race day. Its users say they are comfortable over long distances and they love the wide toe box. 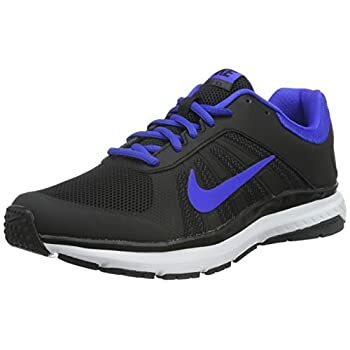 Pros: breathable upper mesh, firm cushioning, provides excellent heel stability. If you want to become a runner or take your running to the next level, the Fresh Foam Vongo is a great option. 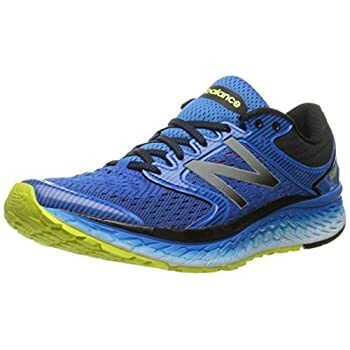 New Balance really does a fine job designing stability shoes and this shoe is among the best. It provides a smooth, comfortable, and supportive ride over any range of any mileage. It’s also lightweight for a supportive shoe. Its lightweight feel is from the breathable air mesh in the upper section of the shoe. If you’re looking for a smooth and stable ride from a company that knows running, then give them a shot. They will deliver a reliable cushioned ride for your neutral stride. Its users are praising it for the thickness they feel under their feet. They also say the shoe is very durable and are well worth the money. 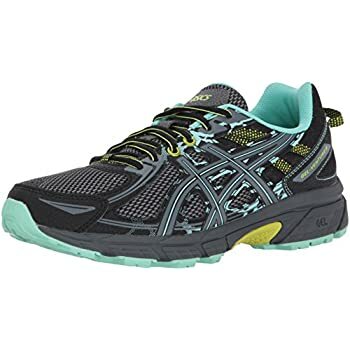 This shoe is excellent for running, fitness class, or even a long day of running errands on your feet. Pros- breathable, excellent stability, great cushion, reliable. Knee pain can be frustrating. Fortunately, finding the right shoe provides a significant chance of eliminating knee pain. The key is to find a shoe that meshes well with your foot strike and one that is comfortable and absorbs shock well. Take a look at these top running shoes and choose one that works best for your – your knees are depending on it!